Yogurtland Kicks off the giving season on November 27 at select locations! Don’t forget that tomorrow is “Giving Tuesday”! Yogurtland is a company that believes “together we can and should do more to help kids”. In order to do that, Yogurtland is celebrating ‘Giving Tuesday’ with a fundraiser for Together We Rise, a non-profit dedicated to transforming the foster care experience for youth across America. On Tuesday, November 27 select Yogurtland locations will be supporting Together We Rise with an all day fundraiser. Yogurtland fans are invited to support this effort by showing a social media post, email, flyer, or mention they are supporting the fundraiser at checkout and 20% of the sales proceeds will be donated to Together We Rise. Together We Rise is setting out to revolutionize the foster care system and change the stigma. By building awareness and volunteer opportunities, the non-profit is enriching the lives of children in foster care and giving them a sense of normalcy and comfort through an unsettling time in their lives. The organization also provides thousands of foster kids across the country with new bicycles, college supplies and suitcases known as “sweet cases,” so children no longer travel from home to home with their belongings in a trash bag. “Yogurtland believes in helping the children in need in the communities where we operate. It’s important for children in the foster care system to have a supportive community that wants to see them succeed, and Yogurtland is honored to be a part of that initiative with this fundraiser,” said John Wayne Carlson, Yogurtland’s SVP of Marketing, Development and Operations. At Yogurtland guests can create their own treat, snack or dessert from a variety of handcrafted frozen yogurt, ice cream, and non-dairy sorbet flavors and an abundant topping bar with fresh fruits, candies, premium sauces, and more to create an experience as unique as they are. Separating Yogurtland from other brands are the company’s flavorologists who continually create craveable flavors that keep fans loving their taste experience. Yogurtland also owns its own dairy, and by controlling the manufacturing process delivers the highest quality flavors, setting new standards for the industry and delighting guests all year long. For more information and to find participating locations, please visit https://www.yogurt-land.com/togetherwerise. Presently, Yogurtland has more than 320 locations across the U.S., Australia, Dubai, Guam, Myanmar, Oman, Singapore, Thailand, and Venezuela. Flavors are always subject to creative change and popular demand. 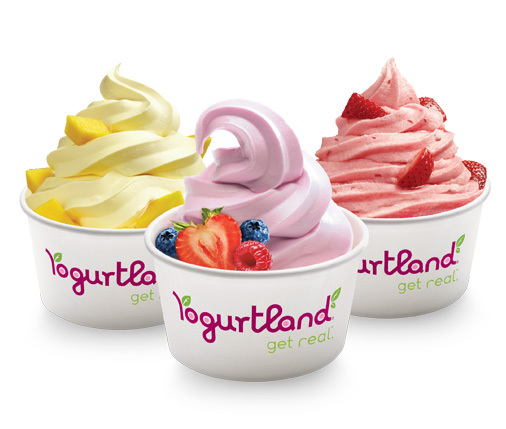 For more information, visit http://www.yogurt-land.com or http://www.facebook.com/yogurtland.